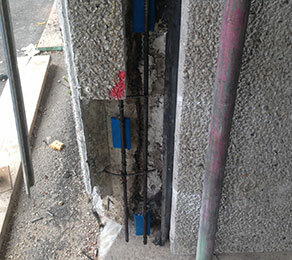 CCL has completed reinforcement work on Bolingbroke Heights sheltered accommodation in Flint, North Wales. Initially constructed in 1966, Bolingbroke had weathered five decades of harsh marine conditions before repair works began, as it is situated next to the Irish Sea and River Dee. Compounding these factors was the issue of previous maintenance of the building – before CCL arrived on site, the structure had received very little external repair or protection work over its lifetime. The result of this was a significant chloride contamination and subsequent corrosion of the tower’s structural reinforcement. These factors led to Flintshire County Council engaging CCL to undertake a number of imperative tasks. The complete removal of defective concrete was required initially, before it was replaced with polymer-modified repair mortars. Corrosion prevention measures such as sacrificial zinc anodes were put in place in order to prolong the longevity and maintain the condition of essential materials, with further replacement reinforcement introduced where required.